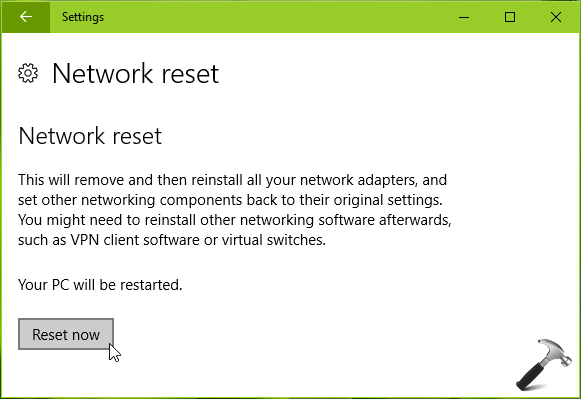 In this post, learn how to fix "This device cannot find enough free resources that it can use (Code 12)" for network adapter in Windows 10/8/7. Due to the above mentioned Device status, we were not able to operate the network adapter and thus can’t get online on them machine. According to one my MVP colleague, this error can occur if two devices that are installed on your computer have been assigned the same I/O ports, the same interrupt, or the same Direct Memory Access channel (either by the BIOS, the operating system, or both). This error message can also appear if the BIOS did not allocate enough resources to the device. Hence, first you need to make sure you’ve updated BIOS firmware on the device. Well, if you’re facing this issue, here’s how to fix it. 1. Run the Network Adapter troubleshooter. 2. In the Device Manager, right click on problematic device and select Uninstall device. Then click Action > Scan for hardware changes. 3. Update or roll back the device driver, see if it makes the device working. After performing above mentioned suggestions, we hope the device started to work fine.